Karen Beal, Registered Representative, has 23 years of experience in the financial services industry. She holds Series 6 and 63 Securities licenses as well as her Kansas Life and Health Insurance license. Karen started her business career in the oil and gas industry and has a strong background in finance and accounting. Her previous business experiences has led her to focus in retirement planning from small to medium size businesses, implementing SEP's, SIMPLE'S and 401k's. Karen is very passionate about assisting employees save and plan for their retirement through these company sponsored vehicles. 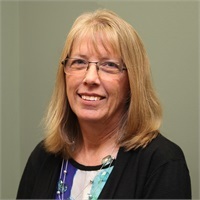 Karen is proud to be a Shocker having graduated from Wichita State University in 1987 with a Bachelor of Science (BS) degree in Business Administration. She furthered her education with a Master of Science (MS) degree in Instructional Technology from Fort hays State University in 2010. In her spare time Karen fulfills her passion of lifelong learning by teaching an online finance class at Friends University. In addition, she and her husband of thirty years enjoy spending time with family.